SRM Technologies, Inc. is a leading business solutions and technology provider specializing in software design and development, systems integration, web services, enterprise mobilization and embedded solutions development. 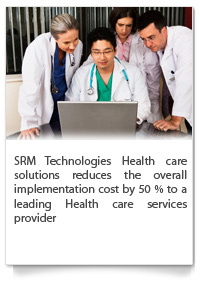 SRM Technologies offers flexible delivery models with the most optimal combination of people, process and technology. Founded in 1998, the company has grown to over 150 professionals with global headquarters in New Jersey and regional headquarters in Chennai, India. SRM Technologies also has branch offices in Santa Clara in the US, Toronto in Canada and Dubai in UAE. Committed to delivering quality projects, services and solutions, SRM Technologies strives to get better continuously in all its practices. "We are committed to consistently improve the processes with the aim to achieve higher quality product and services satisfying Customer needs and surpassing their expectations."